You are here: Home » Happy Fat Tuesday! Fettisdagen är här!!! 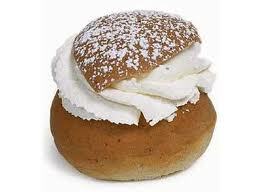 Here’s another excuse to eat sweets before Lent… Swedish semlor! This traditional Swedish sweet roll spiced with cardamom and filled with almond paste and whipped cream is the ultimate Easter “fika” (mandatory Swedish coffee break). It sometimes is eaten in a bowl with warm milk and consumed before the multiple Easter holidays. I am not knowledgeable enough about those exact days, but it is a tradition enjoyed by many Swedes shortly after Christmas until Easter. Although my husband is not crazy about these (almost sacrilege in Sweden!! ), I find them pleasant and delightful. Anyways, anything with a strong brew is fine by me! 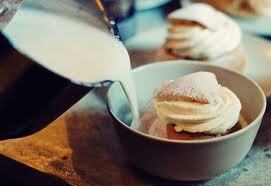 Anna will whip up a delicious batch of semlor every Saturday until Easter for you foodies. And while you are there, you can pick up some Swedish sinful delights like dreamy Marabou chocolate and Ahlgrens Bilar (candy gummy cars). She’s the only Swedish place in town. If you stay awhile, you will probably bump into a few Swedes in Toronto. Happy Fettisdagen, guys! Now I finally had time to read the whole post! Thanks for writing about me and the cafe’, Myleen. I really appreciate it. Your blog is great! Please keep up the great work!! !